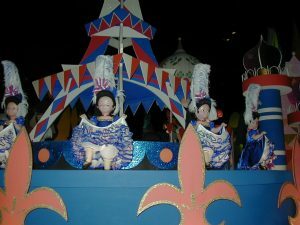 For musical accompaniment while you read this post, click below to hear the song! 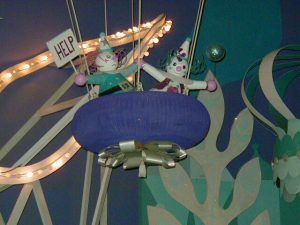 It’s a Small World is one of my favorite songs, and the ring-tone and ring-back tone on my phone, either to the delight or dismay of people who call me. 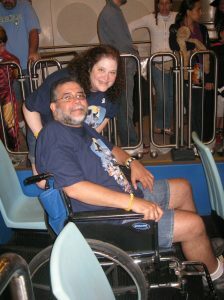 It is also my favorite attraction at Walt Disney World, and was one of Ben’s, too, and he loved that after his diagnosis, he could easily ride right onto the boat with his scooter and electric wheelchair. I do not like to get political in this blog, but I can’t help but think about how timely this song is and wish that we had more politicians who promoted this kind of unity. 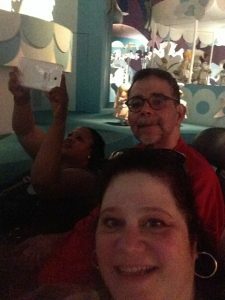 But, this is a blog about caregiving. As a former caregiver, and now a participant in support groups for caregivers and family members of people with ALS, I see so much judgment and the hurt it causes- from caregivers, carees, family, friends and others. Although we all wish we could dismiss the opinions of others, nobody likes to feel judged, particularly when we are already vulnerable and those judgments make us feel inept. It’s so important to remember, and sometimes to look for, the things that we share, even if we take action in different ways. Also, while we debate the efforts that we make, a simple smile is a universal act of kindness that can make a tremendous difference in our lives. Yesterday, I was reminded of how important it is to have compassion and to be considerate, rather than judgmental, of what people are experiencing. We never know exactly what is going on in someone else’s life or how much we might have in common with a stranger. I was waiting outside a movie theater to meet a friend, when a woman came up to me to ask for directions. I directed her back down to where she was walking from and she got very upset, saying that she had just been told to come up the block from that direction. I pointed to the street signs- Manhattan is a grid in most parts- and showed her the precise street she was looking for, which was literally one block away. She showed me the exact address she needed to find, and I confirmed my directions and told her what the cross streets would be, hoping to comfort her by explaining that I lived just below it in the same range of numbers. She was inconsolable. She told me that she was going to her friend’s apartment and was trying to call her, but her friend would only text and would not answer her phone. The woman appeared to be a New Yorker, but I could see that for whatever reason, she was distraught and seemed almost disoriented. I offered to walk her to the block and that seemed to appease her. When we got to the corner, she got upset again, saying that it was the block that she came from. She tried to call her friend again and got no answer. I didn’t understand why she didn’t text her friend but did not ask questions. Since she was so upset, I offered to walk up the block and see if I could spot the building. I quickly found the building, walked back to the corner where she waited for me, and escorted her to the building. As we walked towards the building, she apologized for walking so slowly, saying that she had a lot of health issues. I smiled and said it was no problem and told her that my husband had ALS and I walked slowly with her, remembering how I made those accommodations for Ben, then walked beside his scooter, then his electric wheelchair, sometimes having to help him steer that vehicle. She confided that she had Parkinson’s and I applauded how well she was managing despite her worry. We smiled and wished each other a good day and she calmly went into the building. I walked back to the theater thinking about how at first glance, she just seemed unnecessarily frantic and somewhat unreasonable. Once I understood the context of her panic, I saw that she was probably terribly concerned about walking back and forth, and maybe uncomfortable, tired, and unsteady. But, it really didn’t matter if I understood. What mattered is that I could easily lend a hand and relieve a stranger’s stress. I then wondered how her friend could be so thoughtless to insist on her texting when, with Parkinson’s, she may have found that a difficult task, especially in the severely cold weather. It seemed at the very least, terribly inconsiderate. Perhaps her friend knew little about her illness. In this case, it would be appropriate, and responsible, to ask how best to accommodate someone. The trick is to do it without making the person feel like a burden or to call great attention to their needs. In the case of someone who is reluctant, or too proud, to ask for or accept help, it can be useful to arrange to be conveniently nearby. I have written quite a bit, even recently, about judgments that people made about Ben based on his speech or being in a scooter as opposed to an electric wheelchair (he did eventually need one). As caregivers, we know our carees, and, even at that, sometimes we have to listen to them even though we have our own opinions of how to handle various situations. I was fortunate that Ben never lost his ability to communicate, even though it became more difficult to understand him. He knew himself and his body very well. That’s not always the case, and when it isn’t there is frustration on the part of everyone involved. But, a smile and acknowledgment that we all matter can do wonders to help relieve stress and foster communication and cooperation. I believe that we know that Eeyore is right that, “A little consideration, a little thought for others, makes all the difference.” Ben and my dad always appreciated expressions of consideration and kindness. Likewise, it meant the world to me to know that they appreciated my efforts on their behalf. Sometimes it could only be expressed with a smile and a squeeze of the hand, but that spoke volumes, especially after bouts of impatience and disagreement and, believe me, those did happen! To all who now cannot get that tune out of their heads, I apologize- well, sort of. After all, it is my favorite song! These are a couple of favorite pictures from the attraction. 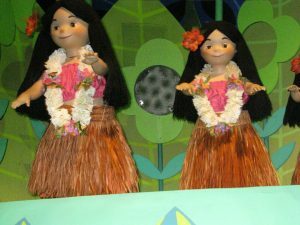 We never passed these girls without shouting “ooo la la” along with them! Some of you may feel like this right now. The sign was on the attraction one year but we never saw it again.